Need a reason to go back to Boscobel? 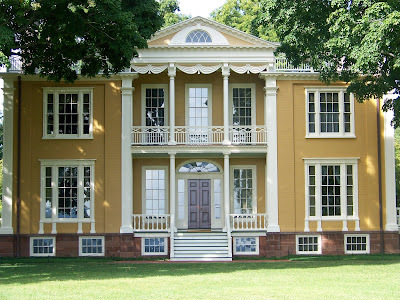 In addition to Shakespeare, GAC Sculptures, the Farmers’ Market and a variety of other special events on its calendar this year, Boscobel is presenting a uniquely, specialized house tour this summer with focus on its virtual showcase of furniture from renowned New York cabinetmaker Duncan Phyfe. House tours through September 10 will conclude in the gallery with a limited-time exhibition curated by Judith A. Pavelock. On display will be Boscobel’s own cheval glass – a “looking glass” which has reflected images as far back as 1820 &#8212- as well as a similar piece on loan from the Columbia County Historical Society and other related objects hand-picked from Boscobel’s collection to be showcased for an up-close and intimate inspection. Mirrors have a universal appeal, and this exhibition offers the chance to see an extraordinary piece of furniture – considered a chic, newfangled item in the 1800s – standing separately and spotlighted for all to enjoy. “This behind-the-scenes exhibition is a rare opportunity to see select objects from Boscobel’s collection apart from our richly decorated period rooms and to see how we determine who made the cheval glass, even though it is not labeled and we do not know the history of its ownership,” says Pavelock. The invention of the cheval glass, a type of tall dressing glass with a trestle base, was dependent upon technological improvements in glass making during the 16th century and the hundreds of 19th century journeymen and cabinetmakers who were inspired by designs they brought to New York City during a time when the economy was resilient, robust and competitive. In 1991, a cheval glass was donated to Boscobel without a maker’s label or history of ownership. It was attributed to the famous French emigre cabinetmaker of New York, Charles-Honore Lannuier (1779-1819). This unique exhibition explores the origins and use of this specialized furniture form and how curators go about the process of attributing furniture to specific makers. Who made these looking glasses? Could the renowned New York master cabinetmaker Duncan Phyfe have been involved in the production of any of these examples? Can the attribution to the famous Lannuier be sustained? Boscobel visitors will have the opportunity to reflect upon these thoughts and more during the exhibit, Through the Cheval Glass: A Study of Form and Attribution, at no additional charge as part of their paid house tour admission June 17 – September 10, 2012. Boscobel is a historic house museum, cultural venue and so much more. Located on scenic Route 9D in Garrison New York just one mile south of Cold Spring, Boscobel is directly across the river from West Point. From April through October, hours are 9:30am to 5pm (first tour at 10am- last at 4pm)- November & December 9:30am to 4pm (last tour at 3pm.) Boscobel is open every day except Tuesdays, Thanksgiving and Christmas. For more information, visit www.Boscobel.org or call 845.265.3638. Hay in the air, a distinctive clip-clopping sound, plus a few whinnies here and there must mean only one thing: it’s Horse & Carriage Day again at Boscobel House & Gardens. Children 12 and under are free this year, so bring the whole family at noon on Sunday, October 9, and enjoy a fun day at one of the Hudson Valley’s most scenic autumn venues. The horse-drawn carriage was the principal mode of transportation in the early 19th century. 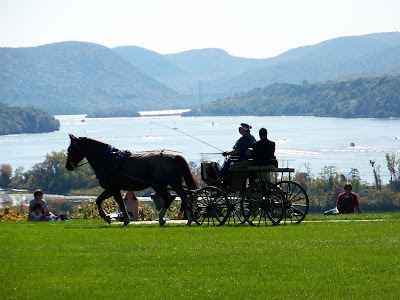 So, it’s fitting for Boscobel, the distinguished 1808, Federal-style house museum to host The Mid-Hudson Driving Association’s parade of antique horse-drawn vehicles and individual riders wearing costumes from the period. Horse & Carriage Day guests will enjoy an afternoon of scheduled activities, including a narrated parade of horse-drawn carriages, competitions where carriages must negotiate an obstacle course, as well as a pony demonstration by the Red Horse Troop Drill Team. Horse-drawn wagon rides around the Boscobel estate are included in the price of admission. “Horsing around” begins at noon and continues through 4pm Sunday, October, 9, 2011. Admission: Adults $10, Seniors $9 and Children 12 and under are free (accompanied by a paid adult.) Don’t forget your picnic basket and blanket or chair. Boscobel is located on scenic Route 9D in Garrison, New York. From April through October, hours are from 9:30am to 5pm- the last tour at 4:00 p.m. The mansion and distinctive museum gift shop are open every day except Tuesdays, Thanksgiving and Christmas. For more information, visit www.Boscobel.org. 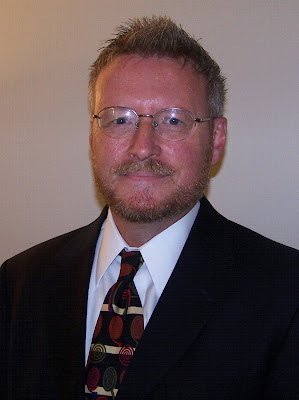 David A. Krol has been named Executive Director of Boscobel House and Gardens, Garrison, New York, effective immediately. Most recently Krol served as Deputy Director of the Lobkowicz Collections in the Czech Republic &#8211 a family collection of four castles, paintings by Brueghel, Canaletto and Velazquez, musical instruments and autograph scores by Gluck, Mozart and Beethoven, rare firearms and decorative arts, a 65,000-volume library and a large family archive. Krol played a role from 2006 to 2011 in the planning and management of the family’s museum at the recently restituted Lobkowicz Palace in Prague. 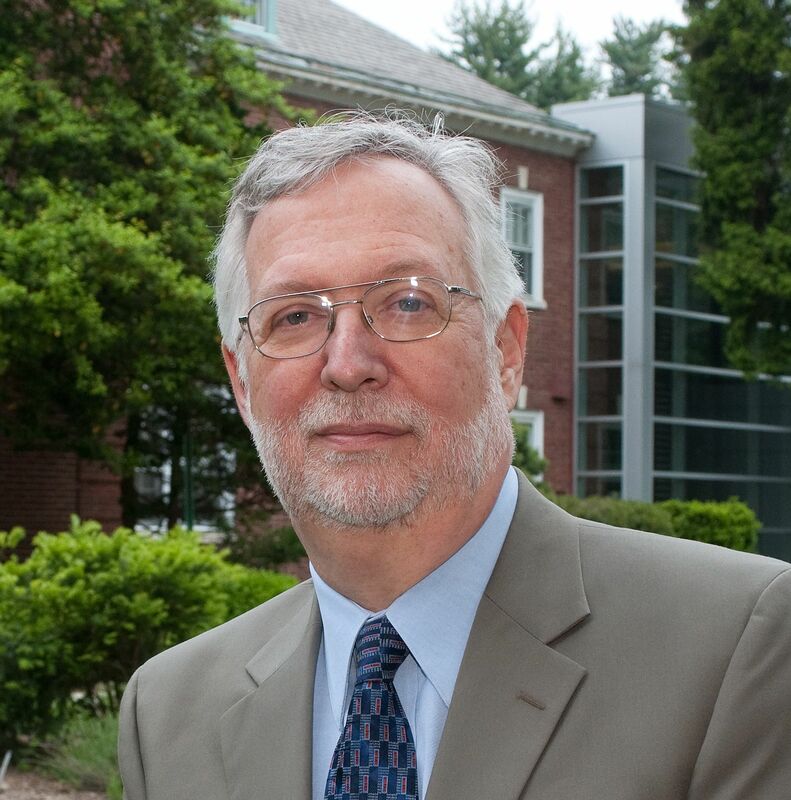 Krol will be responsible to the Board of Directors for leading and managing the collections, finances, facilities, development, programs and staff of Boscobel, which is situated in the heart of the Hudson River Valley. Boscobel is also the site of the the annual summer Hudson Valley Shakespeare Festival. Previous to his assignment in Prague, Krol worked eighteen years in senior management positions at the Metropolitan Museum of Art followed by four years at the American Museum of Natural History in New York City. Born and raised in Pennsylvania and New Jersey, he was educated at Regis High School in New York City, holds a BA in English, Latin and Ancient Greek from Boston College in Massachusetts and attended Oxford University in the UK. Former NY State Governor Nelson Rockefeller called Boscobel &#8220one of the most beautiful homes ever built in America.&#8221 National media mogul Martha Stewart featured Boscobel in Living magazine’s American Treasures section. And Boscobel itself rests on a bluff, dutifully overlooking The United States Military Academy at West Point. So what better Hudson Valley location is there for celebrating America’s birthday than at Boscobel? Monday July 4th from 7 to 9 pm at Boscobel will include a 20-piece jazz orchestra, The Big Band Sound, fresh grilled food by Inn Credible Caterers Chalet On The Hudson, and weather permitting, there will be one of the best views of the West Point Band’s fireworks display in the area. Visitors should pack chairs, blankets and a picnic. Gates open at 6 pm for picnicking. Adults $16, Senior $14, Children (6-14) $9, Children under 6 FREE. Friends of Boscobel adults are just $14. 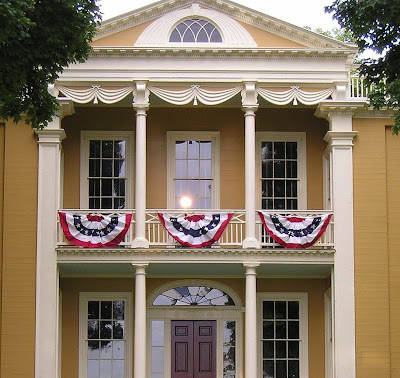 Photo: Boscobel House decorated with patriotic bunting. 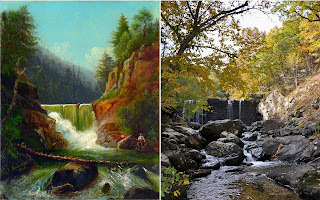 The Hudson River Valley is the birthplace of American Art. For more than 200 years artist have been inspired by its beauty—from Charles Willson Peale and Samuel F.B. Morse to Thomas Cole and the Hudson River School of landscape painting—artists painting the valley and living in the city where a century later Abstract Expressionism emerged. Before Hollywood, Fort Lee on the Palisades was a center of motion picture production, where painters like Thomas Hart Benton worked as grips and extras. Today the Hudson Valley inspires artwork that spans a wide spectrum…from Realism to Abstraction, process-based modes, photography, digital media, hybrid media, drawings made by hand, inventions and transmutations to collages and assemblages that explore issues of environment and sustainability…all are gathered for Boscobel House & Garden’s 2011 exhibition, Hudson River Contemporary: Works on Paper and represent the continued evolution of a great American tradition. Many of the distinguished artists in the exhibition have never shown together before. Sigmund Abeles, Fern Apfel, Carolyn Marks Blackwood, Frederick Brosen, Naomi Campbell, Linda Cross, Anne Diggory, Richard Haas, Walter Hatke, Eric Holzman, Peter Homitzky, Erik Koeppel, James Howard Kunstler, Don Nice, Sylvia Plimack Mangold, Vincent Pomilio, Raquel Rabinovich (2011 Lee Krasner Award for Lifetime Achievement winner), Susan Shatter, Joanne Pagano Weber, Ruth Wetzel and Douglas Wirls, who all respond to the Hudson watershed in various ways, while others like John Moore, Stephen Hannock, Dean Hartung and Don Stinson update the 19th century landscape painting tradition. Abstract works by Luis Alonso, Sasha Chermayeff, Lisa Lawley allude to mapping, journals, books and domestic objects. Aurora Robson and Emily Brown use plastic waste retrieved from waterways and recycle materials from their own prior works. Photographs by Morse descendant Sarah McCoubrey document a fictional 19th century woman painter. Lensless photographs by Willie Anne Wright capture haunting images of formal gardens. Expeditionary artists Janet Morgan and Gregory Frux have kept journals and made paintings on their travels from the Shawangunks to Death Valley, Morocco and Antarctica. 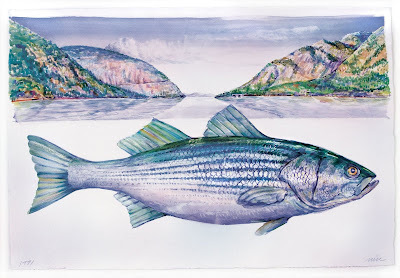 Hudson River Contemporary: Works on Paper is organized by noted art historian Dr. Katherine Manthorne with her husband, visual artist and writer James Lancel McElhinney, in their first collaboration as co-curators. Catalogue essays are written by Dr. Manthorne’s doctoral students at the CUNY Graduate Center in Manhattan with an introduction by the curators and acknowledgements by noted Hudson Valley leader and benefactor Barnabas McHenry. Hudson River Contemporary: Works on Paper opens June 15, 2011 and will run through September 15, 2011 with Gallery Talks scheduled for July 10 & 31, August 14 & 28 and September 11, 2011. The exhibition gallery is open during regular business hours and is included in the purchase of a House & Grounds pass. A full-color exhibition catalogue and poster will be available for purchase in the gift shop after June 15. Boscobel is located on scenic Route 9D in Garrison New York just one mile south of Cold Spring and directly across the river from West Point. From April through October, hours are 9:30am to 5pm (first tour at 10am, last at 4pm). The House Museum and distinctive Gift Shop at Boscobel are open every day except Tuesdays, Thanksgiving, and Christmas. For more information, visit Boscobel.org or call 845.265.3638. Flash back to 1961: the average house cost $12,500, the average car $2,850 and a gallon of gas cost 27 cents. And if you weren’t watching West Side Story or dancing the pony to Chubby Checkers, you may very well have hopped in the old Pontiac Bonneville and cruised over to Boscobel Restoration where house tours were $1 for adults and 60 cents for children. A mansion tour guided by friendly docents, vistas of the Hudson River and groomed gardens with a pond and fountains &#8211 a great value even back then. In May of 1961, Boscobel Restoration, now known as Boscobel House & Gardens, opened its gates and mansion doors to the public for the very first time. Since then, it’s provided the community &#8211and thousands of visitors from around the globe!&#8211 with a historic site that offers breathtaking views, guided house tours, stunning gardens, as well as a variety of special events, concerts, performances and programs. This coming season includes 30+ events, including a very special celebration from 1-4pm on Sunday, May 22nd to commemorate Boscobel’s 50th birthday with free grounds and party admission and 1961 house tour rates. To help celebrate, a variety of area businesses are donating their time and services to create a truly special event: B&L Deli & Catering, Chalet on the Hudson Restaurant, Classic Tent & Party Rentals, Dutchess Manor, Durants Party Rentals, Fresh Company Catering, Highland Baskets/Country Goose, Jonathan Kruk, Storyteller, Pamela’s Traveling Feasts Catering, Rood’s Special Events Florist, Silver Spoon Restaurant and Thaddeus MacGregor, Musician. Free grounds admission 9:30am-5pm- party starts at 1pm and ends at 4pm. Boscobel is located on scenic Route 9D in Garrison New York just one mile south of Cold Spring and directly across the river from West Point. From April through October, hours are 9:30am to 5pm (first tour at 10am, last at 4pm). The House Museum and distinctive Gift Shop at Boscobel are open every day except Tuesdays, May 15, Thanksgiving, and Christmas. For more information, visit Boscobel.org or call 845.265.3638. 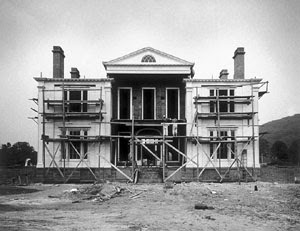 Photos: Above, Boscobel House & Gardens today- below, Boscobel Restoration under construction in Garrison, NY circa 1961.